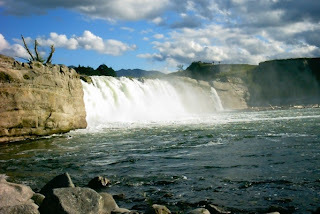 Here, for no very good reason that I can think of, is a picture of the Maruia Falls. I had to steal this from harlequin.co.nz because the one I took got lost somewhere in the dusty innards of my computer. The Maruia Falls are très pretty but that isn't why we send all our visitors there. It's because in 1928 they weren't. In 1928 they were just a plain common-or-garden scenic river. Still Glides the Stream and Shall Forever Glide (1), until the 17th June 1929 that is, when, after a few days of the locals hearing what they thought were aberrant deer stalkers in the hills, there was a mighty cataclysm and the Mairua River suddenly broke in half and dropped nine feet ten-and-a-ninth inches. (That would be three metres, Mr Hague, though frankly I feel your espousal of these narsty - ew - French measurements borders on the philistine.) This is an altogether more satisfying earthquake than the ones where a picture goes slightly askew in a housing estate on the outskirts of Peterborough, even if a clutch of people have to get buried in landslides for it to happen. We haven't had an earthquake for a while and therefore I suppose we ought to expect one. Pleasingly the estate agents have all bought houses for themselves on the Richmond Hills which command a view over Nelson bay, not thinking about the fact that the Richmond Hills only exist because occasionally they shoot upwards three metres at a time. Below the Richmond Hills are the Saxton Playing Fields crammed of a Saturday morning with all the Nelson schools' sports clubs, and it falling to my duty to endure a van-load of the truly mindless conversation of my daughter's hockey team, I thought I would skip spectating for an hour and drop in unannounced on James or Nigel or Sam, who all live conveniently nearby waiting, no doubt, for a hearty terrestrial shaking to land a selection of startled estate agents in their midst. To James McLeod's. James's neighbour was washing his car and had mistakenly thought the entire neighbourhood wanted to hear his choice of what purports to be Music but in fact James, unable to bear the din, had gone out. James is of Scottish descent and, I hope, about to take up the bagpipes by way of retribution. To Sam McEachern's. There stood his blue recumbent on the verandah with its new seat upholstery but there was no sign of Sam nor indeed of any of his neighbours, so perhaps he had spent the morning giving James some preparatory bagpipe lessons. To Nigel Schroder's. No neighbour, no Music, but no Nigel either. And there stood Nigel's new low racer, gleaming in his shed, so obv. they weren't all off secretly riding up the Richmond Hills together. Nigel's new machine is a front wheel drive with a swinging bottom bracket. I knew he'd finished it because he sent me film http://www.youtube.com/watch?v=FG5okNSvpTY of him riding it and he seems to be more in control of it that I ever was of the one I made, which after it whacked me in the side of the head got punished with a hacksaw. Well the roll down - at Marsden Valley, the same place we did the last test - didn't quite go as well as planned. The old bike had topped out at 55kph and on the first run the new bike was faster at 58kph but I had to use the brakes a little to regain control as it started to wobble . On the second run things went a little wrong. I crashed at about 50-55kph. Fell from the bike and slid down the road a little then into a creek hitting some very large rocks on the way. My helmet was completely destroyed. James drove me home, then we went to the hospital where I spent the next 7 hours being checked. X-rays and a CT scan. Luckily nothing was broken. Feeling very sorry for myself today. As for the bike it's ok but it's the last time I'll ride it as a moving bottom bracket, so I think it'll get a rebuild and I'll go back to having a boom and a twist chain FWD. The moving bottom bracket was just too unpredictable. The speedo had a 55kph max after the crash and I hadn't got to the fastest section of the run. My daughter Susan gaily said 'If he keeps the broken bits he can call it Schroder's Cat, cos it can be a crashed and an uncrashed bike at the same time,' which stunningly obscure joke can only be understood by quantum physicists one of whom I am not. Anyway as - surprisingly - there was no gravel rash we can't twin him with Bob Knight, and as there were no broken bones we can't twin him with Geoff Bird. But there were bruises everywhere and he's very sore so we can twin him with oh, just about everybody else in the recumbent-building fraternity, I should imagine. 1. Wordsworth who is famous, or Arthur Streeton who ought to be famouser.